The extra weight I was craving. I always have a can of chickpeas, or mixed beans or diced tomatoes on hand when I cook from certain cookbooks. The cans act as weights that I balance on the spine of the book or on the edge of the page to try to hold the cookbook open to a particular recipe. The alternative is to hold them open with my forearm while my hands stand by uselessly covered in half-made pizza dough or the goop from raw chicken. Sometimes I forget I have anchovy paste on my thumb as I flip pages trying to get back to my gnocchi recipe. It is to my sheer amazement that cookbooks are not all published in 3-ring binders or something equally as functional since they are supposedly a kitchen TOOL. TOOLS help you. TOOLS do not slam shut just as you’re reading, “The key to the recipe is timing….” or suddenly display a flan recipe when you were positive you started out making Coq au Vin. So I am sharing the discovery of the Sagaform “Hold”. 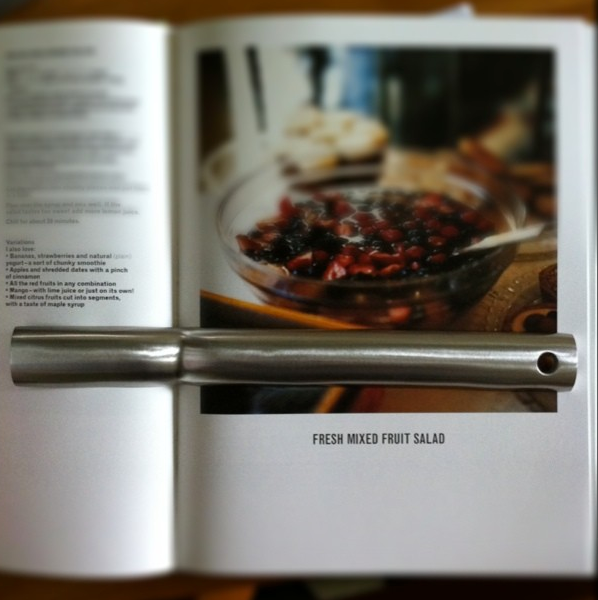 A cookbook weight that holds your flippin’ cookbook flat. It’s compact and easy to clean and even elegant. It even works on the most tight-lipped cookbooks that want to snap shut the minute they’re opened. I tested it. Best of all it makes a great pretend microphone for singing the chorus to On the Floor by J-Lo or prepping for your modest (but slightly cheeky!) interview with Nigel Slater for The Guardian’s Food Section.